There is no question that blondes have more fun. The bounce, the panache, the stunning glimmer of gold locks in either sun or starlight? There’s no competition from the other styles. Unless, of course, you are the infamous Harley Quinn, the notorious and sweet-hearted, if viciously violent right-hand gal of Gotham’s most dangerous villain. Not even blonde is enough fun for her so she has gone the extra mile to create a style that is truly her own. Cross the boundary of insanity with the Women’s Deluxe Harley Quinn Wig and get ready to paint the town everything. This blond wig is made even more vivid with a splash of black and red to match her frequent costume color pallete. Made of kanekalon fiber, this wig is like few others, breathable and as real-feeling as your own, and able to be shampooed to boot! 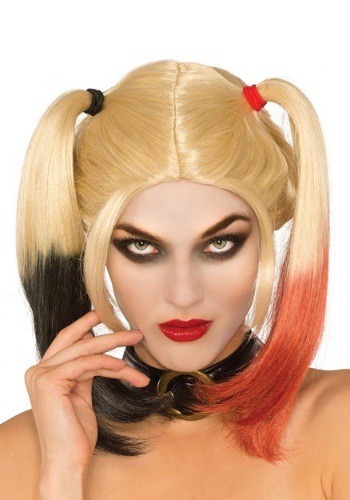 Join your already fantastic hair style with one of many Harley Quinn costumes and you might even lure Mr. J. to come out of hiding to help add his own unique style of humor to your antics.